So who's sporting a big body Ford? Thread: So who's sporting a big body Ford? 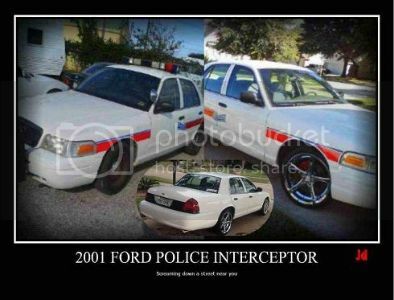 I got a 2001 Police Interceptor with dual flowmaster 10s. Im wanting to go off road with the exhaust. Anybody know any good shops willing to do that for me? I have a 2001 Crown Vic Police.. Ive had 2 mustang GT's 2v before I picked this one up. I gota have a full size car now, the mustang is a lil bit too small for me. Im thinkin of doing a NA build, 4.10 gears, 2500 stall converter, NA cams with ported heads and off road exhaust. If not I might just get a victor junior intake and 200 shot jet from ZEX. what yall think? I know up through 2002 at least, the cv and MGM has a return style system. Slapping on a zex or NOS dry nitrous kit would be easy. ya would be cheaper too..thanks bro. im fixin to call one of our sponsors to customize my H to off road.. unless u know someone else? The cats are before the h-pipe. If you delete the cats you need mil eliminators or a custom tune. Most legit shops won't remove cats. Does your car already have the full dual exhaust? Yes, it comes stock with true dual exhaust. It was hard finding a shop to do it.. But I found a guy just startin out to do it for me. We removed the cats and welded 2.5 inch piping to replace it. Then I had another shop weld the mid pipes to the H pipe.. It sounds beautiful!! and runs great! The rev, sounds perfect, its an aggressive high pitch tone. I can feel the increase in acceleration. I love it. im getting a 2500 stall and gears next. It did throw a code, my check engine light is on but im not worried about that. Ill get a tune. Last edited by Ridin_Dirty46L; 09-28-2013 at 02:09 PM. Just found a 2009 CVPI with 104,000 miles, replacing my driver with it. not much done except a set of 2012 19" wheels that accidentally match the exterior color. Last edited by dsweet; 09-27-2014 at 12:01 PM. « For free -- 2006 black 'leather' rear seat, top and bottom, for 96-2011 C.V.